Let the sleek design and unparalleled charm of this excellent bedskirt complete your bedding ensemble. 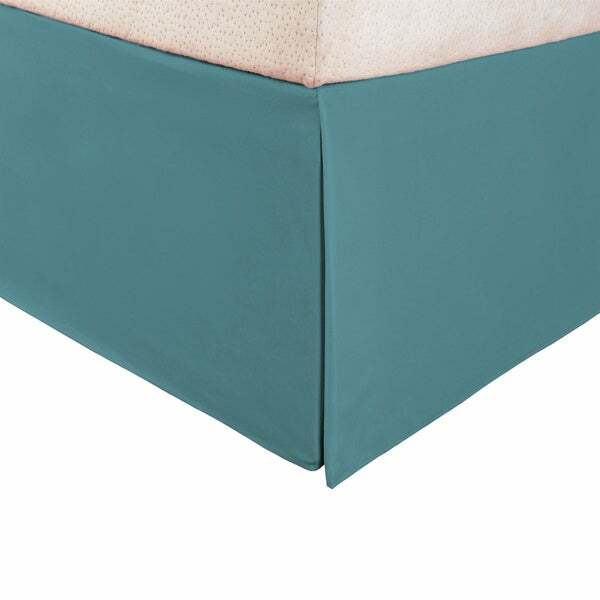 Made from premium 95gsm brushed microfiber, this excellent piece features a generous 15-inch drop that helps keep all the storage beneath your bed clean neat and out of sight. loved the fit (it was perfect). Washed and dried it before putting it on and didn't have to iron it whatsoever. Will buy more. The fabric is soft but light and the colors were right on as described. Unfortunately, both units I purchased were completely wrinkled and took about 1.5 hours (EACH!) to iron out. . . in the past, bedskirts I have purchased were pretty much ready to put on. I'm glad I was asked to write a review for this bedskirt. I will definitely return it. It is so thin you can easily see through it. I purchased the white bedskirt. Maybe the colored fabric is thicker. I'm very disappointed. I will probably buy the new at a store, so I can see what I'm buying. Fair at best. I wish the cotton fabric was a bit heavier. The length is great but it is a bit flimsy. I ordered this bed skirt in white and it came in the original packaging, but has a very prominent stain inside the plastic cover. I can not speak to the quality of the craftsmanship, but I can't believe this wasn't noticed before it was shipped to me. I will be returning. Accurate description, product is good quality and color is very nice. Worked really well for the queen bed in our guest room. This crisp bedskirt always looks nice and neat. It works for higher beds due to the 15”drop. This item served its purpose but it did pill in the wash.
Quality is great..beautiful color..fits as described..as always it came quickly in the mail...great price..looks beautiful on bed. It serves the purpose but don't care for how it hangs and shifts on the box spring. I like the style but the fabric is not very substantial. I also like how it fit the bed. "This states that it is a 15 inch drop and one of the reviews says it’s 14. I have to have 15 inch so could someone check this and let me know?" This bedskirt has a 15 inch drop. "Is the beige a soft golden beige as it appears on the website?" The beige is more of a yellow-cream color. "which is darker between the tan and the beige?" The tan is darker than the beige. "thinking of ordering the teal, wondered if it was more on the blue side or green." "Are these bedskirts considered easy-fit (fit around box spring like a rubber band), or do they 3 point, lay on box spring skirts that become dislodged easily and annoy when changing bedding?" They do have the lay on the box system. However I found a solution to that problem. The bed I have has post legs and I used safety pins to secure the corners near the headboard so that they do not slide around when I make the bed. Also when changing top sheet I always start at the top and stretch the sheet toward the bottom lifting the mattress slightly and it keeps the skirt in place. I find the over box system better than the all round rubber band more esthetic and easier to keep in place as well. It depends on preference. I would dry it at low temp.. It's a full type bedskirt, meant to lay over the box springs, not an elastic system. "is the burgandy more of a deep red/claret or a true burgandy?" sorry, I also ended up buying the gold. I purchased the white so I don't know. Sorry. "It says gold, but the on-line photo looks tan. Is it s true gold?" Definitely gold. Not a bright or shiny gold, but a nice matte gold. Couln'the pass for tan. Sorry. I ordered white. I'm not able to help.